Cyrus K. Holliday wrote from Lawrence, Kansas Territory to his wife, Mary Holliday, in Meadville, Pennsylvania. 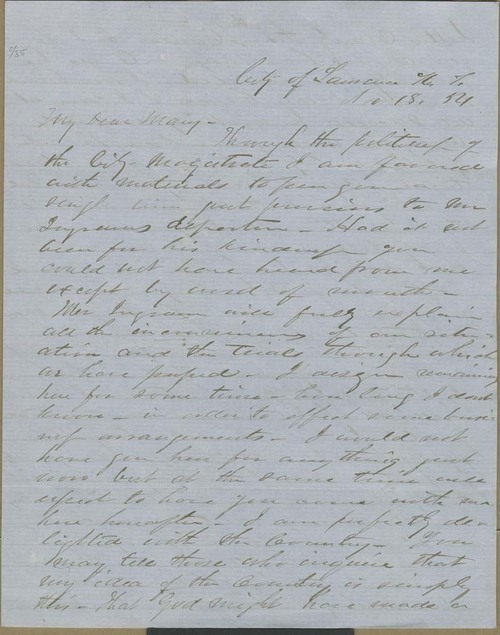 This letter was to be delivered by Mr. Ingrams, and Holliday expressed the possibilities of following shortly or of staying in Lawrence to make business arrangements and put up a building in the spring. He expressed his delight in the country of Kansas and the site of a new city (not named, but likely Topeka). A Pennsylvania company of emigrants, unprepared for the journey and now suffering, had settled in Lawrence and Council Grove.